Winner of the Artful Chef Competition!!! Winner of the Artful Chef Competition…Team Mike Shethar and Victoria Ross Patti!!! 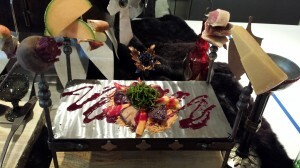 We won with our Game of Thrones theme…four poster platter with food on spikes…..duck prosciutto and smoked melon hanging from a meat hook chandelier……a jeweled chalis….a sword and on-site copper foldformed napkin rings….I really had fun making all of the medieval accessories for the event this past week.